CLEMSON, SC – Cory Norwood said the three-hour wait to meet Clemson players Tajh Boyd, Andre Ellington, Sammy Watkins and DeAndre Hopkins was well worth the wait because he wants his two-year old son Alex to share in his passion. 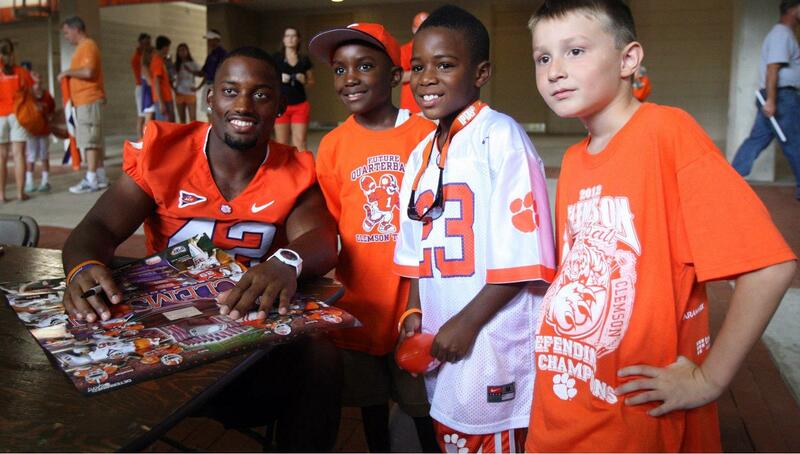 Norwood and his wife Heather were not the only ones waiting in line to meet the 2012 Clemson Tigers. More than 20,000 people gathered at Memorial Stadium Sunday as Clemson hosted its Annual Fan Appreciation Day. The Tigers showed all of that by posing for pictures, signing autographs and shaking hands. “I’m not one for autographs and that kind of stuff, but I like to shake the players’ hands and tell them how proud I am of them and thank them for representing our university in a positive light,” said Tony Guthrie of Pelzer. Guthrie was one of nearly 100 people that gathered early Sunday morning and tailgated outside the WestZone all day. The group coordinated the tailgate through a social media network on Facebook. There were a lot of positive vibes going around Death Valley about the prospects of the 2012 season, which will begin on September 1 when the 14th-ranked Tigers play No. 25 Auburn in the Chick-fil-A Kickoff Classic at Atlanta’s Georgia Dome. “I think it is going to be a very good year,” Guthrie said. “Yes, the offensive and defensive lines are rebuilding, but I think we have enough weapons to make up for that. I think we are going to surprise a lot of people. Norwood thinks the team is looking good too. He says the Tigers are going all the way again in the ACC. “They are going to win the ACC Championship, again, and maybe the National Championship,” he said. And if all that happens, you can bet Norwood will be proud he brought his son to Fan Appreciation Day to meet the defending ACC Champions.